On March 13, the 2014 Earth Hour organising committee worked with the Hanoi City Electricity Corporation (EVN Hanoi) to launch an action month on electricity saving at Trung Vuong secondary school in Hoan Kiem district, Hanoi, as part of the Earth Hour campaign. During the launching ceremony, Danish Ambassador to Vietnam, John Nielsen, sent to pupils at the school a message of protecting the earth and saving energy, starting with acts. According to the ambassador, small acts can bring big changes. Simple actions such as turning off lights and fans when unnecessary, locking water taps to save water, using double-sided papers or cycling to school could slow down climate change. Runner-up of Miss Vietnam 2008 Thuy Van and singer Bao Tram, two representatives of this year’s Earth Hour campaign, shared suggestions on electricity saving to protect the green planet. 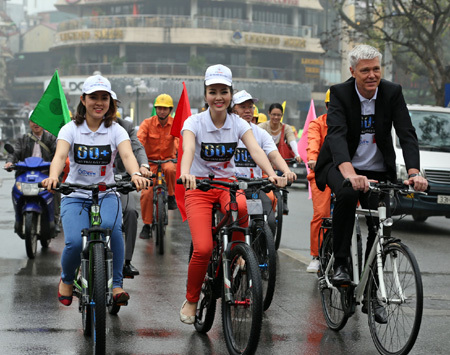 After the launching ceremony, ambassador John Nielsen, runner-up Thuy Van and singer Bao Tram, together with 300 members from EVN Hanoi, rode bicycles in a procession through Hanoi streets to mark Earth Hour. Together with the launching ceremony, EVN Hanoi plans to increase dissemination of power saving information in the city by distributing power saving and Earth Hour fliers to customers; putting up power saving and Earth Hour posters and banners at agencies, schools, residential areas, power companies and 216 customer transaction offices across the city. Earlier, the Ministry of Industry and Trade officially launched the 2014 Earth Hour, with the main event of turning off all lights between 8.30pm and 9.30pm on March 29, aiming to create stronger awareness among people about saving energy to protect against climate change.